When I first saw the 2nd Annual Link Up For Pink Linky Party I knew I was going to join in to show my support for Breast Cancer Awareness. How much fun would it be to make something using lots of pink. This truly is a great cause!! If you have not yet entered you still have plenty of time left to show your support. Here's a little more information from LUFP. We are super excited the day is finally here! We have over $4,000 worth of giveaways from 91 generous sponsors, that makes 122 prizes to give away!!! Complete list here. As we all know, October is Breast Cancer Awareness month, but it should not start or end in October, we should always be aware. Remember to do your self-breast exams, send reminder cards to your friends to get their mammograms, and accompany a friend to their appointment. WINNERS WILL BE ANNOUNCED, FRIDAY, OCTOBER 19TH!! Instead of making a card thought I would try something new and decided to make a tag. A very beautiful tag!! !Just Lovely! !Love the bling! Beautiful tag, loving the bling and great sentiment. Very nice- love all that bling. TFS with us at CTO this week. Lovely card...lots of sparkle! So glad you joined us at FCCB this week! Very lovely tag. Love the design and all the embellies. Thanks for joining Link Up for Pink and good luck in the draw. Loving the bling! Thanks for playing @ CTO! Super tag! Love the bling and all the extra details! What a beautiful tag! Love all the fabulous embellishments...so pretty! What a lovely tag. The layers and focal point complement each other perfectly. Great job and thanks for playing at the Go Fish Challenge! A fabulous tag, love the bling...thanks for joining us at Divas! What a beautiful tag, Tara!! 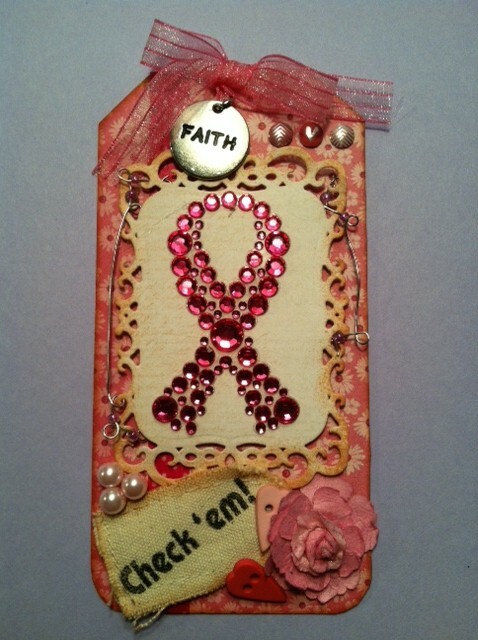 I love the embellishments you used and the sparkly ribbon is fabulous!! You won my giveaway from the Owlsome Fall Y'all Blog Hop of Halloween stamps!! When you get a chance, email your address to me at: indymermaid(at)gmail(dot)com and I will get them in the mail to you!! Gorgeous tag.love all the bling and chram.Beautiful flowers. Love this tag. Great job! 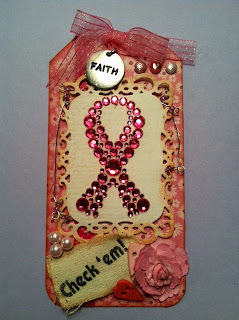 Fab tag...love the bling...thanks for joining the Divas! Lovely project for a great cause. Thanks for playing along with us at GoFish!